As an objective of its business management, Red Eléctrica undertakes to contribute to sustainable development and biodiversity conservation, and therefore, amongst other measures, it develops and carries out various environmental and social projects. The purpose of the project is to develop a tool based on geographic information systems (GIS), which integrates information on the areas of presence and main flight paths of 45 species of birds listed in the Birds Directive and the Spanish Catalogue of Endangered Species potentially affected by risk of collision with power lines. 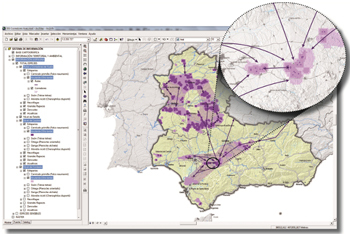 Therefore, the tool allows sensitivity maps to be drawn up at a national level (Spanish mainland and Islands) to identify areas which pose the greatest potential risk of collision, which facilitates more efficient and sustainable decision-making in the planning and development stages of new power lines, and also enables the prioritisation of mitigation actions for existing lines. The information generated is shared with the regional ministries and departments with competence in biodiversity conservation of the 17 Spanish autonomous communities, as well as with research entities and environmental organizations. In this sense, it will act as a common benchmark framework for the environmental assessment of projects, and will favour transparency in the processes of public information and stakeholders’ consultation in the administrative permitting process for electrical installations. Improves the compatibility of electricity facilities and infrastructure with birds, reducing the accident rate due to collision with power lines. Has a positive effect on the state of conservation of endangered bird species; especially those potentially affected by high-voltage power line installations. Facilitates the adoption of solutions with the least environmental impact in the development of projects, as well as the introduction of preventive and mitigation measures. Minimises the impacts on natural capital and generates a benefit for society as a whole, as it will allow the planning and development of electricity infrastructure whilst preserving biodiversity.